In June I was doing music for a Steubenville Youth Conference that Paul J. Kim spoke at. If you haven’t heard of him, you should check out his website HERE. He’s an incredibly talented young man who is on fire for God and has a great message for young people. During his keynote, he talked about going to a Steubenville conference as a teenager and how the host of that conference said something that changed his life. It was a powerful story. The next day, as we were all sitting together at lunch, he looked at me and said, “Hey, I think that was you!” Sure enough, it was. Then two other people on the speaking team that weekend, Megan Mastroianni and Fr. Chris Martin, both shared how I had also been at Steubenville conferences they were at when they were younger (2002 and 1996). This became a theme throughout the summer. 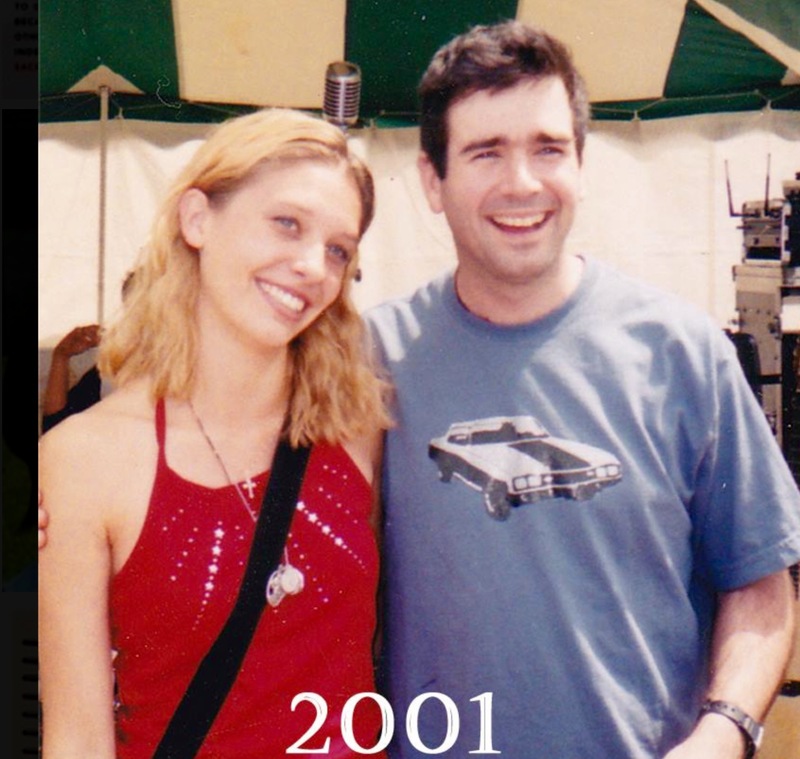 Katie Hartfiel shared a picture when she was a “fan girl” of mine in high school. Oscar Rivera told a story from the stage about how he had a conversion in 1995 (and still remembered the horse I rode in on). Kris Frank, hosting a conference for the first time, mentioned that I was the host at the conference he had a powerful conversation at. My first conference was in the summer of 1994. I was just out of college (Theater major from Rollins College in Winter Park, FL). I had met Jim Beckman (who was the host of that conference) a few months before at the first Catholic Heart Work Camp in Orlando (fun fact: I was the first Carpenter Commando). It was his idea to bring me to Steubenville, a place I had never heard of. At the time he said the weekend could use my gift of comedy (I was working at an improvisational comedy club at the time) to inject some fun into the weekend. But later he shared that he knew in his heart that I needed to experience the kind of Catholic ministry that Steubenville was offering. He was absolutely right. So from the beginning there was a mutual blessing: the conferences blessed me by being a part of them, and I blessed the conferences by using my gifts in the weekend. It began with comedy but soon grew to songwriting (writing many of the theme songs of the 90s), speaking, hosting, and leading worship. In fact, over these past 23 years I’ve done everything you could do at a conference short of concentrating the Eucharist (yes, I’ve even spoken at a women’s session). In 2005 I was asked to provide music for not just the youth but also the adult conferences as well. Since we’re counting, last weekend was my 67th young adult or adult conference. The fact that I’ve done over 140 Steubenville summer conferences really blows my mind. I still find them energizing, life giving, and powerful moments of God’s grace. I am continually humbled and grateful for the opportunity to serve at the Steubenville Summer Conferences. I’m always excited when someone says, “I remember you from 1997!” Even if I didn’t say or do anything particularly profound that changed that person’s life back then, it is cool that God let me be a part of the team of people that blessed him or her. This year the Steubenville summer conferences celebrated its 40th year. What an honor to have participated in 23 of those! While I don’t want to minimize the wonderful things God has done through me over these past decades at those conferences, I also realize that I have been more blessed by having the conferences in my life than vice versa. I could have said no to Jim’s invitation back in 1993, deciding instead to keep doing comedy and music in Orlando, and the conferences would have continued to grow and bless hundreds and thousands of teens. It would have been my loss! Last weekend, just as I do at the end of every summer, I put my guitar down after the closing song of Mass and said a prayer of gratitude. There’s no sign of me stopping right now, but I also know I’m not the master of my own fate. I can’t believe it has gone on this long, so who knows? All I know is that I’m so thankful for being a part of the ministry of the Steubenville summer conferences. I can’t imagine my life without them. So thankful for your ministry! You and these conferences have been such a blessing and growth for me. I would most likely not be catholic without the conferences changing my life in high school and would not feel as equipped to do ministry without your guidance in the classroom. Thank you doc! I was at the Steubenville Main Campus 2 Conference this year with you! A group of us from the LEAD Retreat were in a music video that you filmed at the conference. We are just wondering that will be posted because we would love to see it!